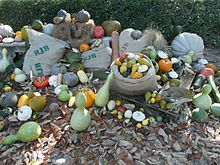 Pira-pira jinis dipamerake ing Real Jardín Botánico de Madrid, kanthi judhul "Variedades de calabaza"
Wikimedia Commons duwé médhia ngenani Cucurbitaceae. ↑ Schaefer H, Renner SS. (2011). "Phylogenetic relationships in the order Cucurbitales and a new classification of the gourd family (Cucurbitaceae)" (PDF). Taxon 60 (1): 122–138. JSTOR 41059827. Diarsip saka sing asli ing 27 February 2017. ↑ Schaefer H, Kocyan A, Renner SS. (2007). "Phylogenetics of Cucumis (Cucurbitaceae): Cucumber (C. sativus) belongs in an Asian/Australian clade far from melon (C. melo)". BMC Evolutionary Biology 7: 58–69. PMC 3225884. PMID 17425784. doi:10.1186/1471-2148-7-58.